"Instead of the usual romantic adventure, Scott and screenwriter Brian Helgeland offer a gritty drama, using the Robin Hood story to depict the birth pangs of liberty. 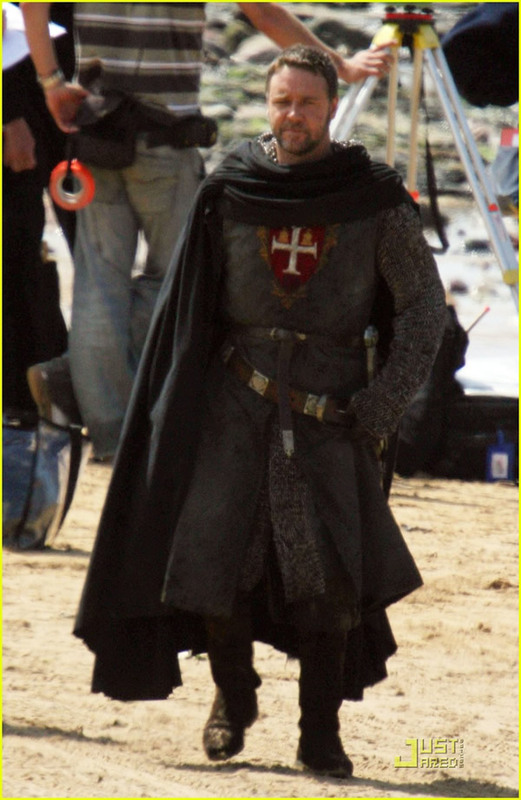 They ground the film in the details of medieval life. We see how wars were fought — the various strategies and weaponry — and how news traveled. We see the attempts at pomp and splendor, the church bells and trumpets greeting the arrival of the king. Mainly we see harshness and ugliness." Harshness and ugliness of our political system... but what does this have to do with Tek-Gnostics, synchromysticism and the western mystery traditions? In medieval times, technological knowledge and hence economic power was in the hands of the craft guilds. The secrets of the various crafts were jealously guarded by the Guild Masters, who also recorded every member's name and individual mark. In many surviving medieval (and other) buildings in parts of Europe today, the original Mason's marks can still be seen. In addition to marks or symbols, the guilds had other ways of communicating their more specialized concepts and religious traditions - especially after the decline of the guilds, much of the hidden knowledge was carried on by travelling musicians, troubadours, meistersingers, and so on. Many of the medieval guilds became famous for their Guild 'miracle plays' which they performed in public, often around Old and New Testament biblical themes. For instance, the Goldsmiths favoured "the Adoration of the Magi", and the Shipwrights "Noah's Ark". Often, both God and the Devil would appear on stage together. One particular character, the Abbot of Unreason, became a figure of satire and, in later times, a distinct irritant to the church authorities. Even into later times, at Rosslyn Chapel near Edinburgh, Scotland for example, it is known that the Sinclair family allowed the play "Robin Hood and Little John" to be performed in the glen in May and June, which is particularily interesting given that this very play had previously been banned. The Scottish Parliament, on 20 June 1555, had decreed that "no one should act as Robin Hood, Little John, Abbot of Unreason or Queen of May." Although these plays were very popular with the public at the time, the church felt that theatre was immoral or, at least, very dangerous. In England, Cromwell's Puritans would also ban "all theatre as immoral" a century later - Scotland did so earlier, due to the severe Calvinist Protestantism, led by John Knox, prevalent at the time. Sir William Sinclair was Scotland's Chief Justice, but "strolling players" regularly performed this play in the glen by his home at Rosslyn Castle after the play had been banned by law. 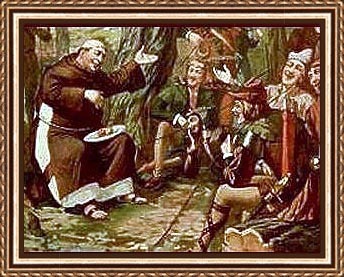 In medieval times, such plays and their biblical themes were appreciated, along with elements that were then tolerated in a spirit of fun, such as the Abbot of Unreason, Maid Marion, and Friar Tuck. In medieval York, the miracle plays performed by the guilds became well known, as did those of Chester, Wakefield, and other centres of these early pageants, and many have survived or revived in some form today. In medieval times, the whole community came to see these plays; many performances would be done at various points around a town, on large wagons or platforms, and the crowds would move from one point to another, similar to going from one station of the cross to another in a church. The symbolism inherent in many of these pageants allowed the ancient mystery tradition to be carried out of the dark ages, to medieval times and into the modern world… in the form of entertainment. Is this not the medium of the “collective conscious” and synchromystics among us? Is not popular media the conduit for the collective psyche of the modern world? I look forward to seeing Scott's version of Robin Hood. My favorite version, so far, has been the early 1990s cable-movie of Robin Hood (w/ Patrick Bergen, Jurgen Prochnow, Jerome Crabbe and Uma Thurman). The Normans vs. Saxons was the prevelent theme in a gritty, gruesome 12th century England. New versions of old, already-filmed stories. Seems that the industry is still in crisis.